The SdJ was founded, because regional youth associations from Sudeten Germans were expelled, as a national youth organisation. 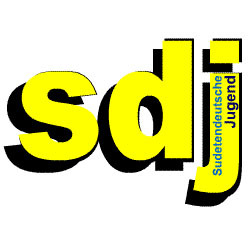 Since 1951 SdJ is also part of the djo (German youth in Europe). Especially in early years the SdJ was important to expellees and displaced people to talk about their destinies and problems, looking for solutions and support each other: for a lot of people SdJ became a family surrogate. The more it was possible to integrate within Germany, the more the focus of work changed. It became more important to build bridges – between young and old, but also between Germans and Czechs. The young generation in particular is able to fix broken ties and work on a future united Europe. The term “Sudeten-German” comes from the 330km long and 30 to 60 km wide mountain range of the Sudetes, and has been used since the beginning of the 20th century as a collective term for the 3,5 million Germans in Bohemia, Moravia, and Sudetensilesia (=Bohemian countries). Before the Czechs intruded into inner Bohemia and Moravia in the 6th Century, this country was inhabited by Celtic and Germanic clans. In the 12th and 13th centuries Bohemian dukes and kings brought German farmers, mountain people, handcraftsmen, and artists into the country in order to open and cultivate the marginal areas. For more than 700 years, Germans and Czechs lived peacefuly side by side. From time to time there were tensions, which, however, had their origins more on religious and social ground. National battles first flared up in the mid-19th century, as the increasing national self-awareness which began with the French Revolution also seized the Bohemian countries. The home of the Sudeten-Germans was for centuries part of the “Holy Roman Empire of the German Nation.” In 1526, the Bohemian countries fell under the reign of the Habsburgs and thereby became part of Austria. Until 1918 the Sudeten-Germans belonged to the Austrian-Hungarian Habsburg empire. Against their expilicit will, the Sudeten-Germans were added to a state of Czechoslovakia (in peaceful demonstrations on the 4th of March, 1919, 54 people lost their lives). This marked the beginning of a targeted politics of de-nationalisation toward the Sudeten- Germans. With the Treaty of Munich on the 1st of October, 1938, the settlement areas of the Sudeten-Germans came under the German Reich (with the exception of a few language islands). Under Hitler’s regime, on the 15th of March 1939, the remaining areas of Bohemia and Moravia were occupied and declared a protectorate of the Reich. After 1945, the Sudeten-Germans were expropriated without indemnity and driven out of their home territory. In the first year and a half after the war, over 3 million Sudeten- Germans were driven out of their home territory, and about 250,000 people died in the process. Afterward, between the former states of Czechoslovakia and the German Democratic Republic, a pact was closed concerning the justness of the expulsion of the Sudeten- Germans, against which, however, the Federal Republic of Germany raised objection. Until today the BRD state that they have never recognized the expulsion and incompensatory expropriation of the Sudeten-Germans. For the Sudeten-Germans remaining in former Czechoslovakia it was strictly forbidden to get organized until 1968. However, the banned people have been, and continue to be, highly active. The first self-help organisation in the expulsion was the “Association for the Protection of Sudeten-German Interests,” founded in 1947, which later became the Sudeten Council after the foundation of the “Sudeten Landsmannschaft” (organisation of german expellees). The SL was conceptualized from the start as a comprehensive, non-partisan, and nondenominational ethnic group organisation. Its organisational structure rests on two columns: on the so-called division of areas, in which the compatriots are organized according to their current town of residence, and then according to the home territory division, in which the compatriots are organized according to their earlier home residence. The organisationally independent Sudeten Youth (SdJ) is also also included in both areas. The goals of the “Sudeten Landsmannschaft” are a) to take part and influence a just ethnic ordering of Europe b) to enforce the legal claim on the home territory and its repossession and the therewith connected right of self-determination. c) to represent the claim of the ethnic group and its compatriots in the rehabilitation of stolen property and the resulting claims for compensation. d) to support the compatriots economically and socially. e) to protect the interests of the ethnic group in the integrated areas and f) to preserve the traditions (values, customs, dialects, cultural assets, etc.) of the homeland, pass it on to the youth, and promote the cultural life of the ethnic group. The “Collegium Carolinium” which was founded with intent to preseve the tradition of the former German “Karlsuniversitat” (Charles University) in Prague, as well as the former German Czech higher schools in Prague and Brno, developed into an institution for the research of past and present of the Bohemian countries and their populations, as well as more specifically that of the Sudeten ethnic group before and after its expulsion. Together with the Sudeten-German archive, it maintains a scientific research library with about 75,000 volumes, and at the university of Giesen it manages the Sudeten-German dictionary. In the socially effectual area of the ethnic group, the Sudeten-German social body has developed, owning facilities in the educational institutions of Badkissingen and Hohenberg at the Eder, which, in addition to social functions, fulfill duties such as schooling and conducting educational institutions in the political and intellectual fields of the ethnic group. In the Czech Republic there have never been any German schools. In Czechoslovakia there was already a newspaper called “Development and Peace” (Aufbau und Frieden) already existed, which renamed itself the “Prague People’s Newspaper”(Prager Volkszeitung) in 1969. In addition, there are the “Prague newspaper” and the “Prague weekly.” In Munich, the “Sudeten-German Newspaper” appears weekly, and there are also over 60 Sudeten-German homeland newsletters which appear monthly or bi-monthly. Through the expulsion, the Sudeten-Germans lost their total possessions, and over 500 villages were for the most part destroyed. The value of the lost private property of the Sudeten-Germans is estimated by secured and customary investigative proceedure at 265 billion DM (in 1981) . A possibility for restitution existed for Czech citizens who were expelled after the 25th of February, 1948. This only applied to a small group of Sudeten-Germans who, after the expulsion of 1945, retained dual citizenship, and re-claimed their possessions after 1948. The most important sports association of the Sudeten-Germans is that of the Sudeten- German gymnasts whose managing committee is in Dusseldorf though there is also a group in Munich. In addition there is an alpine club called “Wandervogel,” and a group of gliders. The Sudeten-Germans recieve financial support from the Federal Republic of Germany and the free state of Bavaria, which is nearly completely limited to the support of cultural and border-transcending activities. The legal foundation of this support is in article 96 of the federal expellee law. Their organisational and political work is financed almost entirely by contributions, donations, and allocations of the Sudeten-German foundation.